Q: How closely does this movie follow the real story about Leopold and Loeb? Q: Why did Wilk/Darrow change the plea from insanity to guilty? Q: Are there any other movies about Leopold/Loeb? 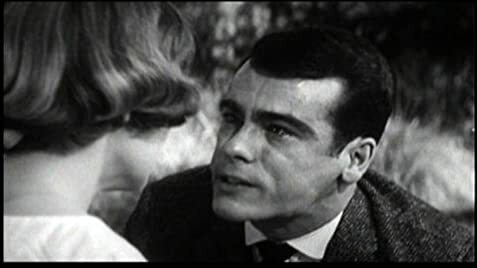 As a result of his handling of this film, Director Richard Fleischer either inherited a reputation for his skill at telling stories about flawed murderous characters or he was attracted to the subject (The Boston Strangler" in '68 ~ "Ten Rillington Place" in '71) Whatever the driving forces he surely displayed a natural talent to examine, and chill, within the genre. 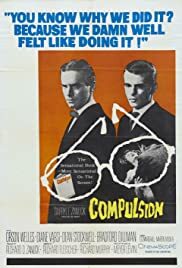 What 'Compulsion' achieves is certainly compelling viewing. With its basis in shocking fact this movie works on several levels. The characters that form the homosexual duo of this shocking case are representational of the 'Crime of the Century' murderers: Leopold and Loeb. Both sentenced to Life + 99 years for the senseless killing of 14yr old Bobby Francis (2nd cousin of Loeb). Their reason for the murder? the thrill of performing the 'perfect' murder based on the repugnant belief of their own 'superior' Nietzscheian intellect! Secondly: as an argument against capital punishment. The parents of Loeb commissioned the services of renowned criminal attorney Clarence Darrow (Orson Wells) who was championing the case against the death penalty. His brilliant courtroom speech is regarded by some as one of the most important turning points in redemptive sentencing. This humanitarian reverse reasoning has proved beneficial in several cases, but how does it hold up within the framework of this modern era? Some contemporary viewers might bring into question the growing number of people who fall victims to murderous criminals - following their re-release into society as being 'CURED' - Sadly this number would appear to be larger each year. When this is considered, along with the rapidly growing number of serial murderers now held in 'corrective' services, it invites the question...if proved guilty beyond doubt, and never to be released, is this then worthy of the very large resources involved?. Difficult situation. The performance of Dean Stockwell (as the Leopold character) is quite astounding, as are all the superb players in this stark drama. Somewhere along the way it would seem some character details, either within the screenplay or the novel, have perhaps been transposed differently from the claims of the real participants and various reports ~ but this tends to occur with many transcriptions of factual events. Oscar winning veteran director of photography: William C. Mellor: earlier known for the good looking "Reaching for the Sun" '41 ~ "Bad Day at Black Rock" '55 ~ "Giant" '56, captures all the tension in striking B/W CinemaScope. Boston born screenplay writer Richard Murphy in the same year adapted Paul Muni's final movie: "The Last Angry Man" for the screen and is also known for, "Les Miserables" '54 ~ "Panic in the Streets" '50 ~ "Deep Waters" '48. His screenplay was based on the novel of the same name by Meyer Levin, writer and producer of "My Father's House" in '47. Director Fleischer a few years later would give us "Barabbas" '61 and "The New Centurions" '72. He begun in the early 40's working on fast paced RKO supports like the acclaimed "Narrow Margin" '52.